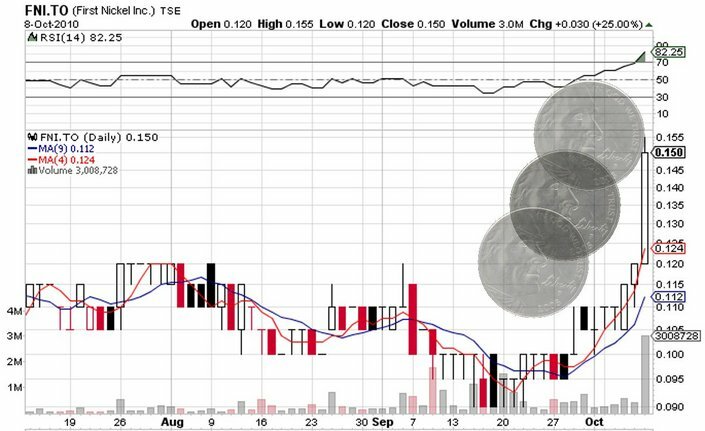 Since the end of September, First Nickel Inc. (TSE:FNI), (PINK:FNKLF) stock moves constantly upwards. Two main factors convinced investors to raise the demand for FNI shares. The last negative price change of FNI stock was two weeks ago. Up to date, the shares of First Nickel Inc. have added 58% to their value. Only during the trading session on Friday FNI stock gained 25%, equal to the 25% nickel content in the five-cent US nickel coin (Nickels). As opposed to the previous trading sessions, which had an average trading volume, this time more than 3 million shares changed hands. This was six times the average for the company trading volume. Though the brilliant share price performance, the stock was not able to overcome the psychological limit of $0.155 per share and close at a new 52-week high. Despite of that news, almost all September FNI stock was in deep lethargy. This month, thanks to the overall increased activity of investors in the trading of precious metals and non metallic mining securities, the shares of First Nickel Inc. were also rushed. But the main strengthener of the stock stir was maybe the obtained a month ago financing for the development activities of the company.